NOTICE: We do not provide gunsmithing services or build guns to customer order. 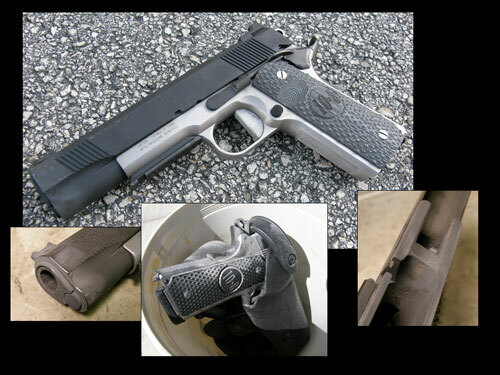 This page serves only as an archive of Hilton's past gunsmithing work on 1911s. The first in a series of pistols named simply with the radio alphaphonetic call sign, it featured a prototype of the new 10-8 magazine well. Replacing the bottom of the frame using the proprietary Briley/Pistol Dynamics CNC machined interface, this sturdy magazine well does not require screws or welding. 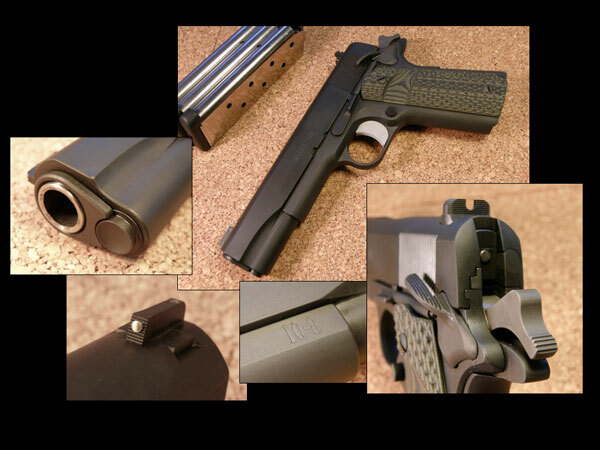 The Alpha pistol also featured the new concave spring plug and recessed crown bushing/muzzle setup. The front sight features a brass bead insert. The sides of the sight blade are narrowed to provide a cleaner sight picture. This pistol features an abbreviated serration pattern at the rear of the slide to eliminate abrasion to the thumb during extended firing. The G10 composite grips are extensively scooped out to provide unrestricted access to the magazine catch. This pistol, along with the Alpha, feature a new design machined grip safety which interfaces stylishly with the bobbed spur hammer. 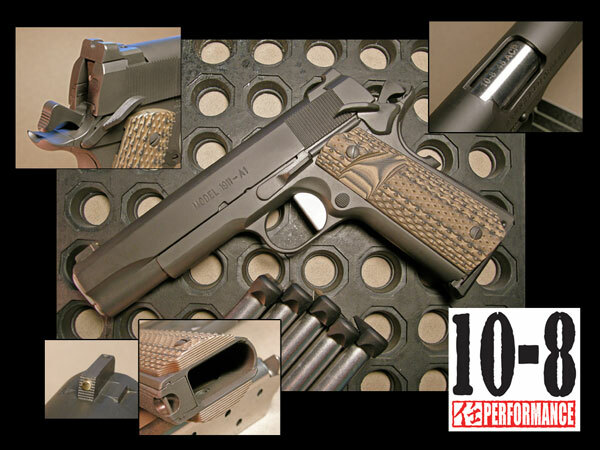 The Bravo pistol embodies the next step in the evolution of 10-8 Performance 1911s. 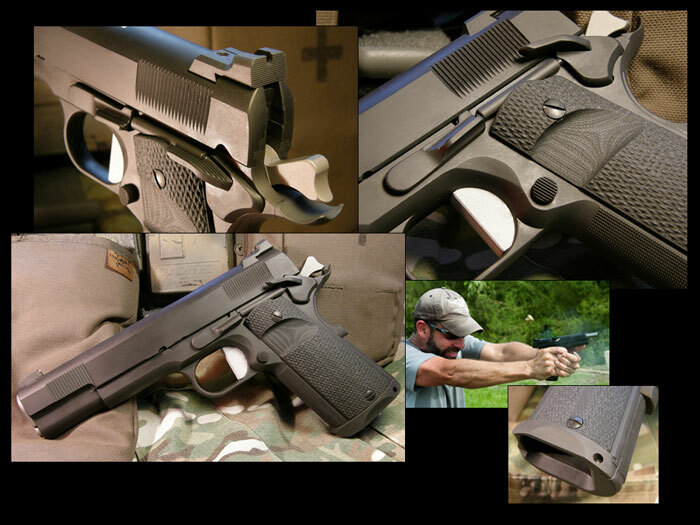 Bravo was featured in the fall 2011 Custom Combat Handguns annual, and is now owned by Chris Costa (formerly of Magpul Dynamics, now Costa Ludus). The third build in the new series was actually a research project, and was constructed entirely from spare parts. It was used for a multiple phase torture test protocol, which included firing 1000 rounds without cleaning and lubrication, as well as exposure to sand. 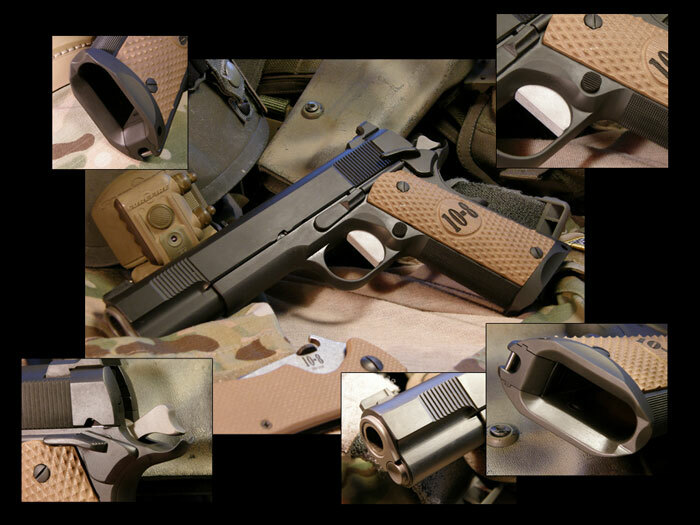 This build was a simple GI style retro gun, with the necessary modernization to make it a shooter. The build includes a full replacement of all the components, with only the original slide, frame, firing pin, and grip safety remaining. The base gun was a Springfield Armory GI. This was Hilton's personal gun for almost two years, and embodies all of the latest developments in 10-8 product development. It features the same integral mag well and machined beavertail as the Bravo, as well as a new serration pattern on the slide. The front strap is hand checkered at 20lpi. A detailed photo album of the entire build process can be seen on the 10-8 Performance Facebook Page. 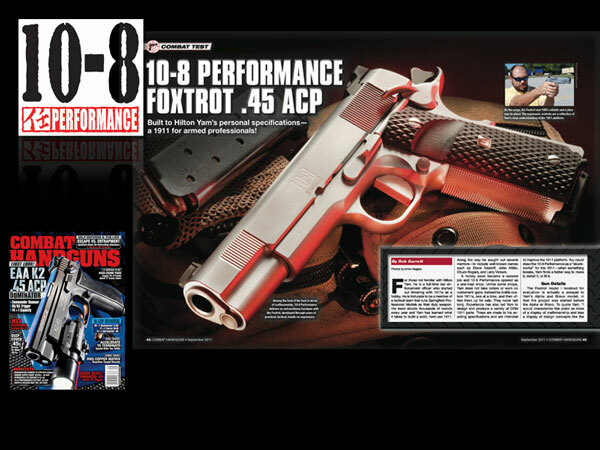 The Foxtrot build was featured in the September 2011 issue of Combat Handguns. This build was started long before the start of the new series of pistols, and has a mixture of old and new features. It is finished in Metaloy hard chrome. Fans on our Facebook page were able to follow the entire build process step by step. Golf was built on a Springfield GI (actually the sister gun to the Delta build) as a clean, stripped down service pistol. It features a newer version of the machined beavertail and a 10-8 match barrel. 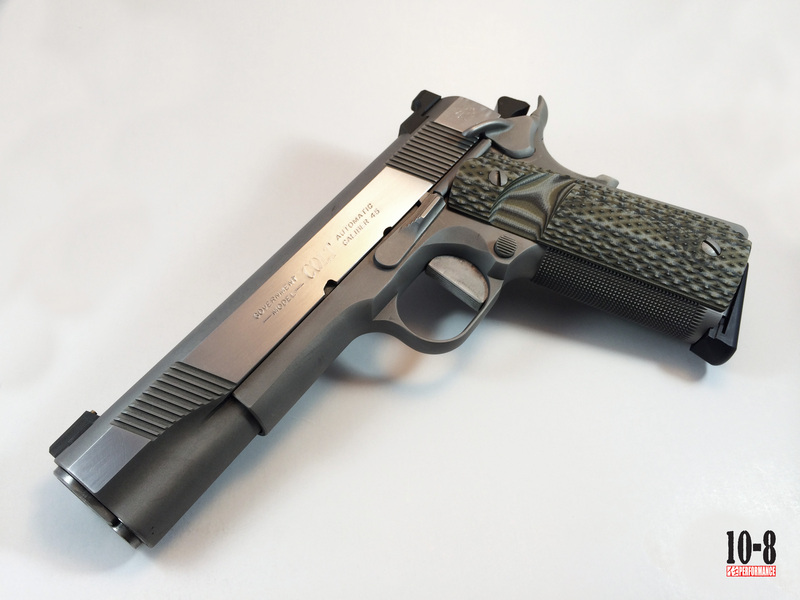 This pistol, built on a 2001 vintage CMC frame, has been the base for several projects over the last 10 or so years. After languishing in the safe for a bit, the frame was brought out of retirement and updated with new parts. Read all about it on the blog. The last in line. 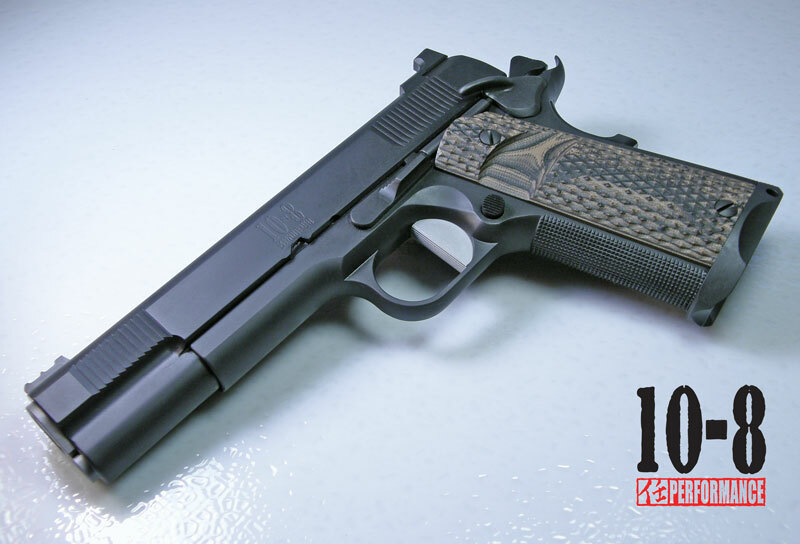 This Colt XSE build was the final 1911 off Hilton's bench, and no other 1911 builds are currently planned. Read about this build HERE.